I have a tendency toward list-making. The desire to create a list increases in direct proportion to how busy I am and how cluttered my mind feels. I’ll resist but eventually, the need for creating a list becomes overpowering and I just have to get it on paper. Except that, in my efforts to live a paperless lifestyle, I no longer try jotting my lists on paper. Instead, I use Evernote. I use Evernote for creating two different types of lists: static lists and dynamic lists. Static lists are those lists that don’t change often, like a checklist. These lists can be captured in a single note and can make use of Evernote’s “checkbox” feature. Dynamic lists are lists that either (a) change frequently–for instance my to-do list; or (b) lists that I want to be able to query and manipulate with ease, like my reading lists. For these lists, I use one note per item and combine both notebooks and tags to manipulate the lists. Below, I’ll provide some examples of how I use each of these types of lists. Review and revise the list from time-to-time to keep it up to date. Let me provide 2 examples of how I use static lists in Evernote. I set my alarm for 8:30pm each evening. When that alarm goes off, I drop what I am doing, pull up this checklist, run through it and make sure all of the items are done. Over time, the list has evolved and changed, but the process is still the same. Make the mornings much easier and less chaotic. Make any changes to the new note that may be specific to that trip. Use the new note as my checklist for the trip, checking off boxes as I check off the item or task. While static lists come in handy for specific things (trips, morning preparation, etc. ), they are pretty much the same thing each time I go through them. But I also make use of dynamic lists in Evernote. I use dynamic lists for many things, but I’ll give two examples: my to-do list and my reading list. In the body of the note, add any information I need to get the item done (phone numbers, email addresses, notes on the subject, etc.) If the information is in some other note, I’ll create a note link to that note so that I can quickly access the information without having to duplicate it. If the item is something that can be tossed, I simply delete the note. If I want to keep the information in the note, I’ll remove the “inbox” tag and file the note in the appropriate place. This is a working list and my goal is to keep it as short as possible. But it is convenient to have it all in one place, and to be able to access it from anywhere, my laptop, my iPhone, my iPad. Each time I read a book, story or article, I create a note with the title and author in the note title (e.g., “Bruce Springsteen at Sixty-Two by David Remnick”). I also note the date I finished the book in the body of the note as well. I think it has been well over a year now since I’ve had to jot a to-do list down on a piece of paper. 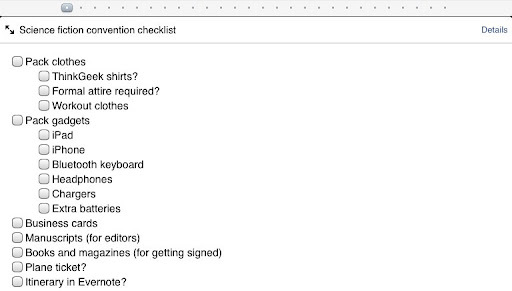 I am able to store all of my static checklists in a single place and access them with a few clicks or swipes. And keeping the lists in Evernote, static or dynamic, has allowed me to more easily capture more information in the list so that I feel better-prepared when I tackle my to-do list or write a book review or blog post like this one. Hey Jamie, it’s Robert, one of your former colleagues. Hope all’s well with you. I didn’t know you blogged nor that you were such a big Evernote user. I’ve converted almost all my notes to Evernote and use it much like you described. As a coder, my only complaint is that I wish they’d add the Courier font to the default font pulldown menu to make it easier to change the font for my code snippets. So you just dump the inbox notes into your general notebook? What about making a separate notebook just for the inbox? This is a good idea and I’m going to give it a try. Greta, the note goes in whatever notebook it belongs (work notebook, writing notebook, reading, etc.) but it is always tagged “inbox”. This gives me some flexibility. If I want to see EVERYTHING on my to-do list, I just need to search for any note tagged “inbox” regardless of what notebook it’s in. If I want to see just my work-related to-do items, the search becomes notes tagged inbox in my work notebook. This is one place where I find tags particularly useful because they cross notebook boundaries. Hey Robert! How are you? Yes, I’ve been blogging since 2005 and using Evernote for about 2 years now. I just took a peek, and at least on my Windows version, the Courier New font exists in the font list. Not sure if that is where you were talking about, or if you really meant Courier and not Courier New. I would think any non-proportional font would work for coding. Recently discovered your Going Paperless blog, and have subscribed to the RSS feed. It’s really good, and I have also adopted similar practices to yourself since I started using Evernote around 2.5 years ago. In the past I have tried both the static and dynamic methods you describe for keeping lists. I have found they work well when using the Windows or Mac version of EN on a laptop, and are fast to add/edits reminders/list items. However, they are a little cumbersome on IOS with my iPhone. If I want to add a reminder or to-do task for myself really quickly, on IOS I have to open EN, hit the “new note” button, then type the actual reminder, and then tag it correctly, and finally save. While that might not seem very much, I would prefer something quicker on my phone. I have tried Nimbulist as an interface between the iPhone and lists in EN, and it’s not bad, but not particularly slick. Since Apple added the “Reminders” app to IOS, I have started using it instead for my To Do reminders, even though there’s no integration with EN. This is awesome & will help me with my reading & reviewing tasks as well as cub scouts. Thanks for sharing! I also use EN for static lists, like preparing for my favorite annual music festival. I include things to do before I leave (make sure I have someone to feed the cat, get cash, gas up car, make enough space on DVR) as well as things to take when I go. I have one to-do list. It can get kinda long. But I don’t really see the value in creating separate notes for every to-do item. Is it because your to-do items usually require more info (phone numbers, etc)? I occasionally add stuff like a phone number on the same line after “call so-and-so”, but rarely need to add tons of info that would warrant a separate note. Is it because your to-do’s are recurring and so they need to be filed back in one of your notebooks after the “to-do” item is “to-done”? I’m always looking for better ways to do something, so if you or anyone can point out an advantage I’m not seeing, I’d appreciate it. BTW, I do have a couple of other lists. I have a separate grocery list. I also have a list of things to take to or bring home when I visit my parents, brother or cousin who live 1 to 1-1/2 hours away. For example, take pants for my mom to hem next time I’m down there. Take gift for my niece. Pick up camping equipment I lent to my cousin, etc. That way before I leave home and before I leave them, I make sure whatever items I need are in the car! Great article about Evernote as usual. I read a lot and use Library Thing to record book collection, books read and wish lists. It is a fabulous resource and all info is held in the cloud. Is it possible to create a link hypertext in a note to another note? How? Is it possible on iMac and iPhone? Really interesting and useful post. It turns out the GTD system I’ve been developing for myself over the last year is almost identical to yours, except I have one folder called Actions and then each note inside is tagged with a context (e.g. @Home). Dom, in the Mac and Windows version of the Evernote application, you can click Copy Note Link from the Note menu. If you then use this link as a hyperlink in other notes, you can get to them directly by clicking the link. The note link format is evernote:// instead of http://. And yes, if you click a note link on your iPad or iPhone, it will take you to that note in the app. Because I often do keep other information in the note, as you point out. Because as discrete units of data, I can manipulate them through the API to make use of them in other system. Thanks, Jim. I do use LibraryThing for my collection (although I haven’t updated in a little while). I’m on Goodreads for books read, but my master list is maintained in Evernote and helps to generate the list on my website. Hi Jamie, I just want to share an info with you about new app for Evernote and GTD users. Me and my friends as Evernote fans’ ve decided to create new, the best for us task manager. So we developed Everdo.it that will be available later this year. It enable synchronization with personalized content of Evernote, but also allow the user to create personal tasks and to do list independently. You can check our web for some screen shots and add info. What does tracking software projects look like? Or is that in EN? For that type of reminder, I find it simpler just to open Mail on the iPhone. With it in my address book, it’s quicker just to type ‘ev’ into the To field. This is one area where Android really shines. Evernote for Android has widgets with an Add Note icon, so you can get right to it.